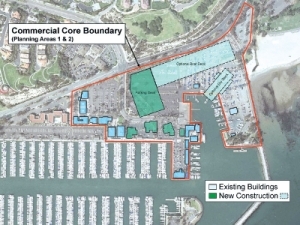 DANA POINT—Development of a highly-anticipated Commercial Core project for Dana Point Harbor was pushed forward when members of City Council unanimously denied an appeal of the Planning Commission’s approved permit on June 17. Noting feedback from representatives of the community and boating advocates stationed in the harbor, more than 150 citizens packed into the Dana Point Community Center to express their position on the project’s value. The appeal, which was submitted by boater’s advocate group Boater’s 4 Dana Point Harbor on May 27, claimed the Planning Commission’s approval of construction failed to focus on ensuring provisions of the Local Coastal Program (LCP) were met by the county’s Coastal Development Permit (CDP) application. The organizations’ president, Bruce Heyman, did not attend the meeting due to a prior business engagement, but a representative delivered a statement on his behalf. The Commercial Core phase, which was approved by the Dana Point Planning Commission with a 4-1 vote at May 12 hearing, includes renovations to existing buildings, reconfigurations of streets and other infrastructure improvements. Segmented demolitions of 13 present buildings, a master sign program, a new parking structure and landscape improvements will also be included in the development, which will add about 35,000 square feet of retail, commercial and office space in the area. Sources have estimated the overall cost of the project between $150 to $180 million. The Planning Commission’s May ruling also included, in concept, a dry stack boat storage building known as “the boat barn.” The Coastal Commission will vote on the application of the reported $32 million structure at a later date. City officials said that the 65-foot edifice is necessary to preserve the Coastal Commission’s requirement that 493 spaces be available for dry storage boats. Heyman said in June he estimated the loss in spaces to boaters would be roughly 25 percent. “We again find ourselves in a situation where members of Boaters 4 Dana Point Harbor are asking City Council to correct errors that should have been addressed by the developer before coming to the council,” he said in the statement. Boaters, though, still came out in droves to express their disbelief over the loss of facilities once construction is underway. Rosie Garcia, a Laguna Niguel resident who docks in the harbor, said she is concerned with not knowing where her boat will be relocated when the area is reconfigured. Proponents of the Commercial Core, though, said the project’s delays have gone on too long. The plan has been in the works for well over a decade. James Lenthall, vice president of the Dana Point Boaters Association, said his organization favors harbor revitalization, but doesn’t want boater resources to be lost in the process. “In the briefest of summaries, we would like to see requirement of a publicly-disclosed finance plan for harbor revitalization, one that demonstrates that boaters will not pay a disproportionate share of a predominately commercial revitalization,” Lenthall said. Lenthall said that even though the council didn’t attach revisions to the permit in its decision, he and his organization will continue to move forward. Construction is slated to begin during the first quarter of 2015. A second phase in the revitalization process includes the dry boat storage facility and waterside renovations. Both will have to be approved by the Coastal Commission. The waterside improvements will include replacing the harbor’s 2,500 boat slips. Before any of those being, though, members of both City Council and the public conceded that an appeal is likely.